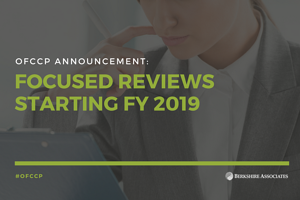 Starting with fiscal year 2019 (which begins 10/1/2018), OFCCP’s future scheduling lists will include focused reviews covering Executive Order 11246, Section 503, and VEVRAA. These reviews will issue from the same neutral Federal Contractor Selection System (FCSS) used to identify contractors for supply and service evaluations. OFCCP will begin developing staff training to conduct these reviews. OFCCP will work to develop assistance and guidance for contractors regarding focused reviews. Contractors are curious about what they can expect with this new directive. First, the size and frequency of the scheduling list generated by the OFCCP’s National Office using the FCSS are determined by the agency. Therefore, it is impossible to predict when the next list will be issued. OFCCP issued the most recent list in February 2018, sending out 800 Corporate Scheduling Announcement Letters (CSAL) to contractor establishments. OFCCP typically does not generate a new scheduling list until all locations on the prior list have been scheduled for an audit. The list prior to the current one was issued in 2014 however, the agency has pledged to be more efficient in handling reviews, and we should not count on a four-year period before the next list. Second, it is important to understand that a focused review is part of a compliance evaluation. OFCCP’s FAQs define a compliance evaluation as the investigation and review process used by the OFCCP to determine a contractor’s compliance with 41 CRF Chapter 60. It may consist of any one or a combination of the following procedures: compliance review, offsite review of records, compliance check, or focused review. Most contractors are accustomed to the compliance review defined in the FAQs as a comprehensive analysis for the hiring and employment practices of the contractor, the written AAP, and the results of the affirmative action efforts undertaken by the contractor. The FAQs further explain that all compliance evaluations will begin with a request for the current AAP and a full desk audit. It is assumed if the compliance evaluation becomes a focused review, the contractor can expect a more intense investigation of certain aspects of compliance. Finally, the Directive states that on-site reviews are anticipated as OFCCP seeks to conduct a focused review of the targeted issue(s). The Directive names all three OFCCP enforcement authorities: Executive Order 11246, Section 503, and VEVRAA as potential subjects for the focused review. The FAQs leave some questions unanswered by stating that the Director of OFCCP has the discretion to change the subject for focused reviews periodically and the change will be announced prior to the issuance of the FCSS scheduling list. What should contractors do now? Continue to ensure your affirmative action developments meet all the requirements for compliance. A thorough review of all employment practices, outreach and recruitment efforts, selection procedures for hires and promotions, evaluation of the effectiveness of efforts, compensation systems and practice, impact ratio results, and employment policies will ensure that you are ready to meet the focused review challenge in the future.